Long time readers will know that I love the book Artisan Bread In Five. The Artisan Bread In Five Blog is one of the sites I read regularly. I get so many ideas from reading their site. When I read their post about breakfast pizza using the basic dough, I knew I wanted to try making a version of it. I knew it was something my family would enjoy. When I made this, my family loved it. We used it as a breakfast for dinner dish, but it would also work well for breakfast. This dish is quick and easy to make if you have the dough waiting in the fridge. Preheat oven to 425 degrees with cast iron pan in it for 20 minutes. You want the pan hot, that is why you heat the pan. Roll out a piece of dough to about 12 inches or the size of your pan. Carefully lay dough into hot pan. Bake five minutes, check partway through baking and if dough is bubbling poke air bubbles with a fork. 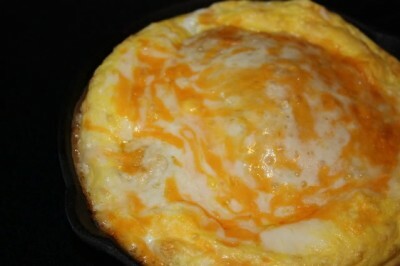 Pour eggs over partially baked dough, spread with meat, and cheese. Bake 8-10 minutes. This may vary depending on how thick you dough is. I finished mine off under the broiler for 1 or 2 minutes, to brown the top a little. This works well with the Artisan Bread In Five dough, but I think you could adapt this to use other doughs. For more breakfast ideas see Life As Mom. This sounds wonderful! Is there a pic? It looks like there would be, but I just have a big white square there… maybe it’s just my computer. Hi Lynn! I just found your awesome blog from foodbuzz and love it! I am from Oklahoma too and haven’t found too many food bloggers from our state so it is fun to read yours! Pizza for breakfast sounds GREAT!!! to me. Again yummy…this sounds good too! !